Zip, Rap, and Dip with our spectacular guides at Belizean Dreams Resort. Whether you enjoy the adrenaline rush of zipping through the jungle treetops, rappelling down ancient Mayan caves and waterfalls, or tubing through underground caves, Belize’s dense jungles and extensive cave system is the perfect playground for eco-adventurers. An exhilarating mix of nature, adrenaline, and speed awaits you on any of these thrill-seeking adventures. You will certainly earn your bragging rights with one of our amazing jungle tours. After working up a sweat with our zip-lining excursion, take a refreshing tour of our cooling rivers while cave tubing. Hike for 20 minutes to the entrance of the magnificent cave system. You will reach a stunning lagoon surrounded by steep limestone walls to witness the mystery of “Xibalba,” the heart of the Mayan underworld. By now you are in the depths of this ancient cave system and can float along in the darkness, with your headlamp as the only source of light. Led by our guides and gently pushed along by a flowing current, you will pass through impressive sanctuaries used by the Maya for sacrificial rituals. Plunge into darkness if you are brave enough to turn off your headlamps, and listen to the sounds of the cascading waterfalls and rapids. Requirement/ Restrictions: Zip-lines can hold up to 250 lbs. The waist of an individual must not exceed 48 inches. For cave tubing, an individual must be 40 inches in height. Our Cave Tubing and Canopy Zip-lining Tour is part of the all inclusive Mayan Jungle & Beach Vista Package as well as our Honeymoon/Romance Package. Discover the “Mother of all Caves” with our tour to the Actun Loch Tunich sinkhole. A strenuous hike through the Maya Mountains leads you to the mouth of the cave. Peer down the sinkhole and simply be in awe of the 300 feet drop. Our professional guides who are experts in maneuvering the cave will rig a system of rappelling ropes for your descent. Get suited and be ready for the drop of a lifetime! Hearts pounding and adrenaline pumping, the first few feet of the drop provide the speed. Further into your descent behold the sights of the rainforest and jungle below. Once you’ve made it to the bottom, reward yourself with a delicious picnic lunch. You deserve it. Don’t get too comfortable, the next step is... how do you get out? Climb your way out of the sinkhole of course! The Black Hole Drop Tour is not included in our all inclusive packages. The difficulty level of this tour is moderate to challenging. Located in the Mayflower Bocawina National Park, less than 15 miles from Belizean Dreams Resort, our friendly guides will lead you to a pristine hike through the Belize jungle. Explore unexcavated ceremonial Maya mounds with temples and ancient ball courts hidden beneath its surface. Archaeologists are still uncovering the history of what’s hidden below the overgrown jungle. As you get deeper into the lush rainforest look out for orchids, birds, and exotic animals. The hike to Antelope Falls is truly worth the effort. As the 1,000ft fall cascades down the massive rock face, take in the expansive views over the jungle and out to the sea. End your hike with a refreshing swim in the oasis - a smaller fall that fills a beautiful emerald pool, at the very top of the waterfall offering you a breathtaking view. Thereafter, you will head to the Bocawina Zip-line, which offers two and a half miles of zipping with three traverses as high as 2,300 feet. This is considered the longest zip line in Belize. The entire course has eight traverses and twelve platforms with two free fall rappels. The double cable course is ACCT certified and our experienced guides will make even the faint of heart feel safe and secure. Requirement/ Restrictions: Zip-lines can hold up to 200 tons. The waist of an individual must not exceed 48 inches. This tour can be very challenging and is not recommended for those with knee and back related issues. The Jungle Zip-lining and Waterfall Hiking tour is not included in our all inclusive packages. Located in the Mayflower Bocawina National Park, less than 15 miles from Belizean Dreams Resort, is the longest zip-line in Belize. This zip-line is two and a half miles long, with three traverses as high as 2,300 feet. The entire course has eight traverses and twelve platforms with two free fall rappels. The double cable course is ACCT certified and our experienced guides will make even the faint of heart feel safe and secure. Looking for even more adventure? Bocawina National Park is also home to several waterfalls, including Bocawina Falls and Antelope Falls. 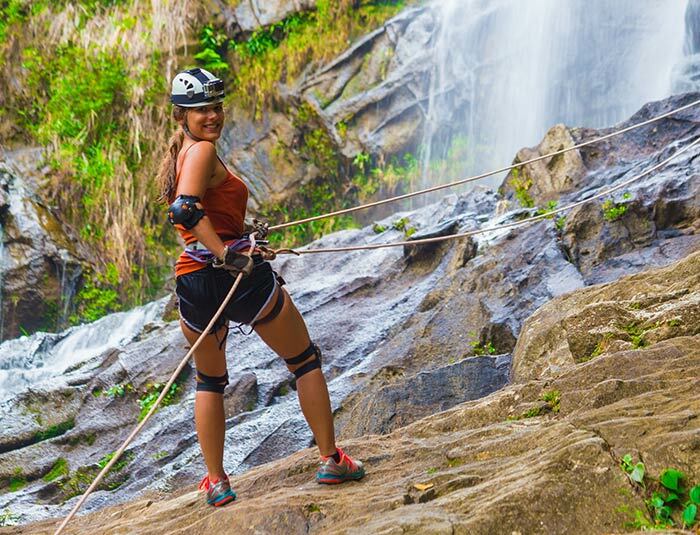 The Bocawina Falls rappel is family friendly, consisting of a 20 minute hike to the top of the 100ft waterfall and an energizing rappel down. The Antelope Falls rappel is for more experienced hikers as it requires a rigorous 1,000ft hike and rappel to the bottom. Included: transportation, certified guide, packed lunch, and taxes & fees. Requirement/ Restrictions: Zip-lines can hold up to 200 tons. The waist of an individual must not exceed 48 inches. The difficulty level of this tour is moderate to challenging. The Jungle Zip-lining and Waterfall Rappelling tour is not included in our all inclusive packages. Discovered in 1989, and open to the general public since 1998, this is hands down the most talked about cave in Belize. It was named the #1 sacred cave in the world by National Geographic. For the fit and adventurous, this three miles deep ATM cave is surely a must-see. ATM Cave, also known as the cave of the crystal sepulchre or Xibalba, is located in the Roaring Creek Valley in a karstic limestone terrain. On approach, the hourglass shaped entrance of the cave rises before you with the river rushing pass from the inner depths of the cave. Within its dark recesses you will discover large clay jars, left long ago by the Maya people, in hopes that the gods of rain and fertility would find them suitable offerings. Ceramics, stoneware, and skeletons lay forgotten for centuries. The most famous is “The Crystal Maiden,” a young girl sacrificed and left for the gods, her bones slowly claimed by the cave and calcified to the sparkling, crystallized remains you can view today. Your tour starts with a 45 minute hike in the cool tropical rainforest where you will cross three streams and eventually enter the cave’s hourglass shaped mouth for a 30 foot swim in water that reaches depths of 15 feet. You swim until you touch bottom and land on a rock shelf. The next 2,000 feet is a journey that takes well over half an hour. It is filled with many sharp and slippery edges and water depths alternate from just covering your toes to portions where only the tallest won't need to swim. After this distance you ascend seven to ten feet to a shelf above the river. From this point forward it is shallow and you walk barefoot (with socks only) to protect the cave. As you go forward you will encounter increasing amounts of pottery, tools, and ceremonial items in all sizes and in conditions from near intact to completely shattered. The artwork found in Actun Uayazba Kab (a section of the cave) is unmatched when compared to any other site. The deeper in the cave you go, the more recent the activities of the Mayans were. Use of the cave by the Mayans of the Late Pre-Classic (1 to 250 AD), shows they tended to stay near the mouth of the cave, whereas later generations moved further into the cave, perhaps believing that this would bring them closer to the gods of Xibalba. A not-so-common artifact is human remains. So far, remains from fourteen individuals have been found; seven adults & seven children (all under the age of five). These are not the ceremonial burials found in the other two caves in the area, but are sacrificial victims. They were all likely sacrificed in the hopes of appeasing the gods to bring rain. Young victims, particularly females, were important for rituals to be "zuhui" - pure and uncontaminated in the eyes of the gods. The Crystal Maiden was a young woman of about 20 years old whose complete remains lie at the back of the cave. It is believed that she was clubbed and left for dead and with the passing of time she has been cemented to the floor in a layer of brown calcite. To reach her final resting place, you must climb aluminum ladders mounted on a sheer rock face. Don’t choose this tour if you are not an adventure lover, it is not for the faint of heart! The ATM cave tour is not included in our all inclusive packages.